The Confession by Charles Todd is the 14th book in the Ian Rutledge mystery series, which usually pertain to The Great War or WWI. In this book, Rutledge hears the confession of an aging and dying man in 1920 about a murder he committed during the war. When the body of the man who confesses to murder is found in the Thames, Rutledge’s informal inquiry into the alleged murder is kicked up a notch and has him traveling between London and Essex. The man had given him a name, which turns out to be false, and the mystery of how this man knows whom he’s accused becomes a mystery in itself. While set after the war, it is clear that the battles have impacted Rutledge, and many of the men and families he encounters in the book as he unravels the murder mystery. Todd’s mystery resembles that of Sherlock Holmes, though Rutledge’s Watson is Hamish who died in the war. Deductions are made carefully from a series of innocuous events and statements from witness, neighbors, and others as Rutledge attempts to trace the heritage of the Russell family in Furnham. And of course, there are some red herrings. Todd’s WWI mystery is set two years after the end of the war, but WWI’s presence is still felt, especially in remote Furnham where the residents like to be left to themselves and don’t take too kindly to outsiders, especially the authorities. The town felt the presence of the British military keenly when they took over a local farm to build an airfield for fighters and to keep an eye on potential invasion forces. Shell shock is just one aspect of the war mentioned and show throughout the book, but there also are moments where trench foot is discussed as well as the societal impacts of the war on those families left behind by enlisted brothers, fathers, and lovers. 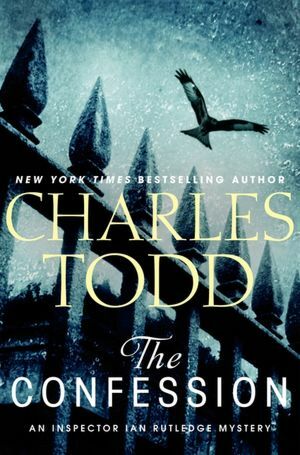 The Confession by Charles Todd is a compelling historical mystery set just after WWI that will have readers turning the pages eager to see how Rutledge battles his own ghosts while chasing those of the Russell family to solve a number of mysterious deaths and murders. While part of a series, it can be read as a standalone mystery novel, but readers will be eager to pick up the other books in the series. 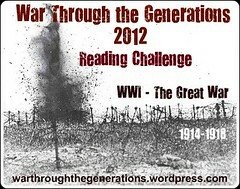 This is my 3rd book for the WWI Reading Challenge. Also if you participated in the War Through the Generations Civil War Reading Challenge, don’t forget to enter the giveaway. It ends tomorrow, Jan. 31, 2012. 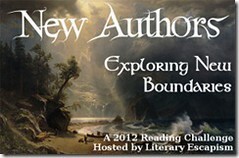 This is my 5th book for the 2012 New Authors Challenge. Mailbox Mondays (click the icon to check out the new blog) has gone on tour since Marcia at A Girl and Her Books, formerly The Printed Page passed the torch. This month’s host is the Let Them Read Books. 1. The Confession by Charles Todd for review and the WWI Reading Challenge. 2. Lovesick by Spencer Seidel for a book tour with Meryl Moss Media Relations in February. 3. Cinder by Marissa Meyer from Shelf Awareness. 4. The Book of Lost Fragrances by M.J. Rose for blog tour in February. 5. Graveminder by Melissa Marr for TLC Book Tour. 6. Thirst No. 4: The Shadow of Death by Christopher Pike from my husband and daughter for Christmas. 7. The Night Circus by Erin Morgenstern from Anna and her family for Christmas. 8. The Tiny Book of Tiny Stories Volume 1 by Joseph Gordon-Levitt, which I purchased. What did you receive? I hope your holiday was filled with books.